The SmartPipe™ Crawl Space Drain is compatible with the CleanSpace® Crawl Space System for a dry crawl space! If you have a flooding, leaking crawl space, it will affect your entire home. Fortunately, most crawl space drainage problems can be fixed in about a day-- without disrupting your home. Basement Systems Vancouver provides crawl space services of all types throughout the area, including flooded crawl space repairs in British Columbia. We proudly serve Vancouver and areas nearby, including Abbotsford, Burnaby, Coquitlam, Langley, Surrey, Vancouver, West Vancouver, and nearby areas in BC. Call or e-mail us today for a FREE dry crawl space quote! The best way to dry a crawl space that is experiencing groundwater seepage is to install a crawl space sump pump. The sump pump will then collect the water and discharge it from your home through a discharge line. At Basement Systems Vancouver, we also recommend installing SmartPipe™ around the inside perimeter of your crawl space. SmartPipe™ is the first custom-engineered crawl space drainage system designed just for crawl spaces. With five rows of drainage holes covered with a clog-resisting filter fabric, SmartPipe™ is specially designed to collect crawl space groundwater and direct it to the sump pump system. Even when your crawl space has no standing water, it can still have damp conditions. Humidity and water vapor will continually enter a crawl space through concrete and dirt surfaces. Once your crawl space drain has been installed, it's a good idea to protect your home further. Installing a crawl space vapor barrier, along with airtight crawl space vent covers and doors is key to this. At Basement Systems Vancouver, we provide the CleanSpace® Crawl Space Encapsulation system, including our 20-mil thick crawl space liner that's warrantied for 25 years. 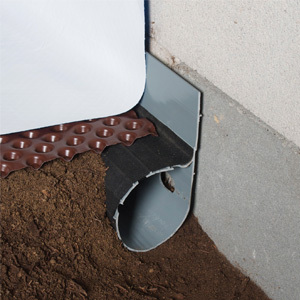 The SmartPipe™ Crawl Space Drainage System has been designed to be a integral part of the CleanSpace® System and can be installed with all of our products, including our crawl space insulation, vapor barrier, sump pump, and drainage matting. If you would like a FREE, no-obligation estimate for a dry crawl space, we're ready to help! Call or e-mail us today to get started. Let us help you get rid of that musty smell in your crawl space!